With the help of Hontech LTDA, Animatics’ Brazilian distributor, Prof. Jorge Antonio Giles Ferrer Dr. Eng. 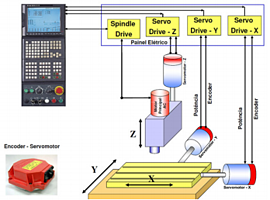 and his assistants Eduardo Moreno and Carlos Eduardo de Almeida Brito are developing a technical tool for teaching students speed control and placement of a CNC system driven by integrated SmartMotor™ servos. The “kit didático para o ensino da tecnologia CNC” or “kit for teaching CNC technology” is being developed for the SENAI Schools at “Armando de Arruda Pereira” located in São Caetano do Sul city, in São Paulo, Brazil. This specific campus is a manufacturing automation center that develops and offers technical undergraduate and graduate courses in mechatronics. SENAI, properly translated, stands for National Service for Industrial Training. 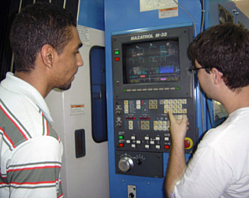 SENAI is one of the most important institutions in Brazil, providing formal training in the areas of mechanics, construction, chemistry and machine building. 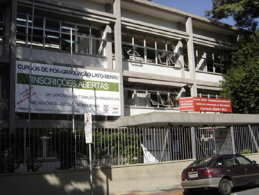 There are 744 of these schools operational in all Brazilian states, offering more than 1,800 classes ranging from basic engineering to intensive high level professional training. João Bahia, founder of Hontech, attended the Animatics Institute held in March of 2011 at Animatics’ headquarters in Santa Clara, CA. The Animatics Institute provides for an introduction into SmartMotor technology and related products and accessories with sessions for both novice and seasoned programmers and a focus on real world applications. “The Institute was a very good way to improve my knowledge about SmartMotor servos and their capabilities. The material was very useful and it helped opened up opportunities such as this one with SENAI,” said Mr. Bahia. Frequent problems in machining such as inaccuracy and machine vibration are often caused by the machine parameters not being optimized, lack of uniformity in MP and lack of rigidity in the CNC machine. Unless the operator has previous experience using a servo driven CNC, these kinds of mistakes are inevitable. The root of the problem, as Dr. Ferrer has found, is a lack of teaching equipment. 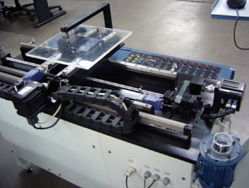 Most factory CNC machines don’t allow users to interact with the machine and learn in a dynamic, lowpressure, hands-on environment. The CNC teaching tool Dr. Ferrer and Hontech have developed is built with both mechanical and electronic elements similar to those of an industrial servodriven CNC machine, including the SmartMotor. The SmartMotor has an integrated controller, incremental encoder, communication ports and EEPROM memory for program storage. The SmartMotor is also capable of contouring mode, allowing smooth continuous motion over long paths. Cubic spline interpolation between data points further advances SmartMotor’ performance to cost ratio compared to competitive systems on the market. All of this is an advantage for students preparing for the technology of the future, which promises to be more compact, more integrated and more capable. A user interface was developed for the machine that allows for the user to compare the actual response from parameter modification with a mathematical model of what responses should be generated from the machine under ideal settings. Students learn how to adjust the CNC parameters as well as the velocity, torque and acceleration settings of the SmartMotor and PID parameters of the controller. The resulting adjustments can then instantly be compared to the input, allowing as little difference between the output and input as possible the minimize overshoots. Download the PDF version of this case study here. © Moog Inc., Animatics All Rights Reserved.